Not only does it come with hundreds of elements, it is as always extremely well organized. Each card follows a flexible grid and a strict layer structure, creating consistency across all cards. This is a perfect instrument to make your ideas minimal, readable and easy to follow. 296 flowchart cards: Covering the most popular categories. Responsive: Made for both desktop and mobile. 64 iOS cards: Designing for iOS? We got you covered! 40 smart arrows: Using 9-slice scaling. 32 icons: Numerical and functional. 7 button styles: Success, information, warning and error. Print friendly: Light theme making your flows easy to print and ink-friendly. 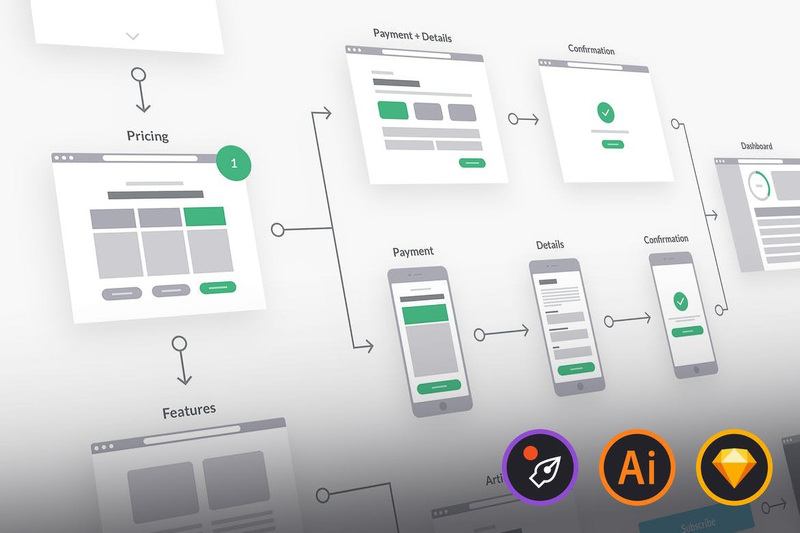 Completely re-organized with symbols for a lightning fast workflow, create UX flows or simple wireframes in no time. Each card is available in two versions, one for desktop and one for mobile. Cards included in this set are based on the most popular categories, covering: headers, features, testimonials, teams, pricing, blog, articles, gallery, eCommerce, portfolio, call to action (CTA), contact, social, sign up/in, settings, dashboards and footers. Tools are exceptionally easy to use and carefully assembled. All UX flowchart cards 40 arrows are available both as vector and as smart arrows. What makes them smart is the 9-slice scaling, learn more about that technique over here.